Okay, we all know that the father is a psychopath. But are there other psychopaths around? HM is a punk kid, but he doesn’t actually seem that bad. It is more like he is acting up and will get thrown in jail for hurting someone due to his need for attention and love from his father who is a serial killer. DJ seems a bit crazy though, or maybe he is just really off? Is he suppressing his psychopathic nature? That isn’t it though, MW, might be another psychopath. He is so strangely calm and his smile is off. I also have a feeling that he might have accidentally on purpose killed his mother. So, to wrap it all up, the one bad kid might not be really bad and the two very good kids might be psychopaths? Is anyone else getting that vibe or is it just me? The two daughters seem very normal. 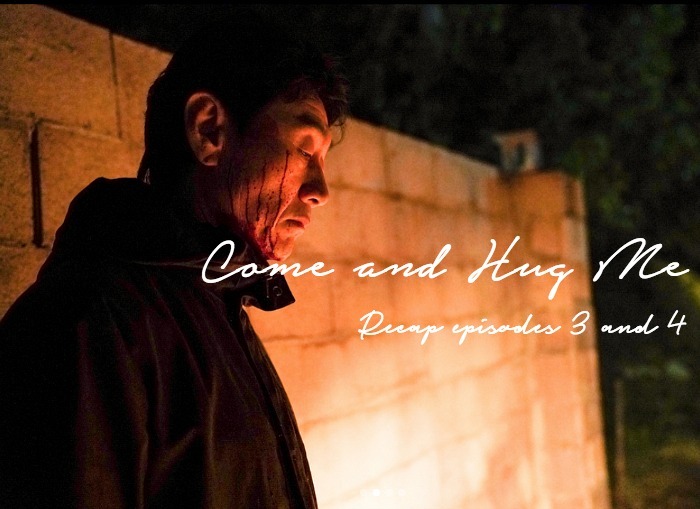 In addition to that, call me crazy but there is something sweetly creepy about Come and Hug Me. Perhaps it is all the cherry blossoms all around? Or the OST? Or maybe because these characters seem like they are nicely hiding something under their perfect smiles? We open at the ending of the last episode. The father is in the basement with NW and his son. She says she lost her dong and …. I found the name tag in front of your house. HJ asks if she lost her dog? You are a bad girl…because of that tiny thing you break into someone’s house and look around? NM quickly says she is his friend, the first friend that he has at school. Then he tells her that this is her dog. She hops up and he helps her get the dog out by breaking open the lock. NW dotes on her dog. NM looks apprehensively at his father. He looks stone-faced back at him. But then he chuckles and tells her to go out. NW sees NM’s hand but he tells her not to talk about it. he takes her hand and leads her out, his father is behind them. HJ – You are NM’s friend, Ajusshi didn’t know that and told you something I shouldn’t say. I put the dog there to find the owner. It was sub down and there wasn’t a name tag soI pitied him. He was a new dog. NW – Why did you put the dog somewhere like that? He has an injury on his mouth also. HJ shows his hand and says that he bit him. Dog’s shouldn’t bite humans right? He was aggressive so I had to put him in the cage and use a mouth guard. By the way, does he have all his shots? She says yes and she says that Lucky doesn’t’ bit people. HJ says owners always say that. But it can happen. Do you live close? NW says yes, they moved yesterday and her dog got lost. HY notices NM holding NW hands. He says he never knew that his son dated a pretty girl. NM says he is his friend, he will take her home. HJ smile and says that he should take her home, it is dark and rainy, see you again pretty friend. NM tells NW that they should leave now. She tells his father goodbye and walks out with NM. HJ smiles as they leave, but his smile doesn’t’ stay long. His face grows hard as he looks at his son continuing to hold NW’s hand. then he goes into the basement and chuckles for a moment. The oldest son beats up on another student. the other students think HM should quit school, why does he come, he will kill someone soon. MW goes outside his classroom and asks the little boy that got hit if he is okay. MW calls 911 with the boy’s phone and tells him that it is an emergency. HM asks MW what he is doing. MW ignores him and continues talking to 911. When he is done, he talks to HM and asks him if he is the one that made that kid like that? What is he doing here? If he dies what will he do? If his stomach burst, then he can die. HM doesn’t’ care, he says his life is all screwed up already. MW asks HM if he ever killed someone, does he knows what that feels like? Whatever you do, that is the worst thing. HM gets a text message. It is from his mother, she wonders where NW is, she isn’t picking up her phone. Elsewhere, NM and NW are still walking. She wants to know if he is angry because she went to his house unannounced or because she was surprised to see his father? She grabs the umbrella from him and then they go to sit so she can dress his wound. He says he is okay but she says he isn’t okay. He suffered a lot this morning because of her but he doesn’t say anything about that. He is also getting soaking wet because he only covers her with his umbrella why are you suffering all by yourself? NM apologizes. This makes NW tells him that she is the one that is sorry. She is sorry that she got angry at him and that she went into his house without permission and that she was surprised to see his father. She is just sorry. But why was I that scared? They stand up. NM rests his hand bandaged hand on her shoulder and tells her not to come to his place ever and forget everything that happened and forget me as well. Just ignore me, I beg you. She asks why she has to do that. NM gets home and looks through the house. VO – You shouldn’t come to my workroom without my permission okay? MN goes into the basement and sees NW’s dog. He sees all the tools out. NW – Tell me, why should I do that? NM – Just in case you (are in danger). NW – No, that is what you ask me to do, fine< i will forget about it and never go to your house, but you….no, I won’t forget you. I like you…..Won’t you ask me why I like you? Yoon Na-mu, I think you are really like this tree, like your name (namu=tree). That is why I like you, because you are just like a tree. I am a little awkward saying this, but that is what I feel. if you tell me that you hate me, I will just like you more. Don’t you like it anyway? NW smiles at NM for a moment. the rain stops and the cherry blossoms fall. NW walks around as she looks at all the cherry blossoms and dancing in them. NM looks at her. She goes back up to him and holds his hand. VO – This is the first time connecting…. NW – You didn’t’ say that you don’t like it, I will like you however I want and I will be friendly with you in whatever way I want. The rain stops so she tells him that they should go. VO – When we were connected, I feel like the world is heaven (Nakwon = Heavenly place or paradise). VO – The moment I wasn’t connected to her, I can’t even remember it. Meanwhile, HJ is at home looking around his son’s room. NM’s desk is clean and he has so many awards for being a good student and having good behavior. Appa sees a note. The little sister sees that the father has a hammer behind his back, she calls her mother. the brother is also looking for his sister frantically. He approaches everyone who he thinks looks like her. hen he gets a phone call from his mother. She tells him that Nk-won came back home. MW sighs a sigh of relief. He asks if she is okay. She says he is, but she came home with a very shy friend. Cut to SJ walking around and looking for her brother. She runs into her older brother. Oppa asks what is up with her face and tells her that she shouldn’t’ come out this late. She says she is going to her mother’s store. HM wants to know why she is going there. But the sister just walks past him as a bunch of drunken men walk the street. HM gets a text from his teacher: Hey, HM, call me now and don’t make matters worse. HM decides to run after his little step-sister. She asks him why he is following her. they happily walk next to each other. But the little sister is annoyed. back at NW’s house, HW dresses NM’s hand. She asks if this is because of Lucky? He says it is because of himself, Lucky is a good dog. HW tells him that she can take him home, is your mom home? He says his mother is working at the restaurant. She asks when she comes back but NM just says that he didn’t want to make her worry. HW thinks Umma’s want to know these things. But NM says he met her for the first time 2 years ago and she worries about him and his brother. His real mother died when he was 8. He thinks she is always with them all the time, she told him that she will be with him all the time, so don’t tell his stepmother, This is all his fault so if you have to punish us you can just punish me because Nak-won isn’t at fault. HW tells him that his name is Na-mu, it is a nice name. You should visit us often and be good friends with NW. She is a little dangerous like a little bomb, can you look after her? NW runs down the steps and asks for a hot chocolate. She sits next to NM. Umma says she makes NM uncomfortable, don’t sit so close to him. But she says that they are best friends now. Umma tells her that her daughter is a straight shooter. NW just grabs a cookie and starts eating it. She makes a joke and NM smiles at it. But the moment gets awkward so NW says she will make the hot chocolate herself. Umma chuckles at her daughter and NM. Appa gets home right at that time. NM greets him. Later, NM leaves and is walked out by the family he thanks her for the cookies. HW tells him to bring his sister next time. And she gives him a necktie and it looks like he might be wearing new clothing. the entire family tells him to be good friends with NW, no no no, keep some distance and just be friendly with her. She is a little strange, but just endure her like Buddha or Jesus would. They happily wave goodbye. NM leaves with all his gifts and the family watches him go. After walking for a moment, he looks back and smiles. Soon, he runs into MW on the street. The brother says he is wearing his clothing, you went to my house? Was NW with you? NM apologizes. MW says she is my only sister, don’t’ do anything that I would be worried about, I am asking you and warning you. MW continues to his house. NM watches him for a second, then he turns back toward his path with is all dark and foreboding. Umma calls Home and says that SJ is at the restaurant, your brother brought her here. they hang up and umma notices that HM’s shoes are all bloody. She argues with him about fighting. But HM says she doesn’t’ care about him anyway, she only cares about NM who calls her ummoni and is good at studying. It’s okay with me. Other ajumma’s are the same. But Umma asks him how he can say that. She makes his meals and cleans his clothing and gives him money. He says he will just leave, his clothes are getting all the food smell in them. She looks at the older brother and then whispers in Umma’s ears. HJ asks NM if he took his pretty friend home well? NM says yes. HJ sees all the new clothing and the food. NM tries to hide it. HJ tells him that he remembers what he told him at the farm right? You remember because you are smart and don’t forget what you see or hear once. tell me what I told you. Someone like us and the dog I wanted to rescue, what is the difference. NM – Nothing, all the same, because we are all animals. HJ – that is true, humans are only animals that are looking or a chance to kill each other. Flashbak to a dog kennel. NM is maybe 8 years old? Maybe younger. HJ – this world is a big cage where there are animals that we call human. the weak are sacrificed and only the strong ones survive. You can survive in this cage called the world. HJ grabs some food and throws it at the dogs. The dogs go crazy. HJ – You saw it right? The thing that makes people strong is force, not pity. Pity or sympathy makes people weak, it has no meaning. You should be strong like Appa. Appa only trusts his own kids because the only someone that won’t backstab me is my own child. That’s my boy. He hugs his son and rubs his head. HJ – You are my blood. HJ – Next time, don’t’ do anything dangerous like that again, don’t’ come to my basement and don’t’ oppose what I say anymore. If you do that then I will be angry, okay? NM agrees. HJ tells him to go to bed for school tomorrow. He says his sone is very smart, he is different from HM, he never disappoints him. Good night son, my precious boy. HJ leaves. NM turns around and sees the hammer on his desk. VO – if you can’t do it then I will do it, I will remove everything that puts you in danger. Without anything blocking you, humans are strong, just destroy everything, whatever is bothering you. NM picks up the hammer and looks in the mirror. he thinks back to what NW told him about not forgetting him because she liked him. He also thinks about the wonderful things HW told him and how they were so kind. He drops the hammer and looks back at the door. VO – I will protect you from anything that makes you weak. NM eats alone. NW sits with him and tells him that he is ignoring her again. He never looked at her all day long. You only answer when I ask you. Let me see your hand. NM doesn’t’ want to because everyone is watching. She says it is no problem, just let me look at your hand. I want to see your wound. Two girls come up to the table and talk to NW about getting a celebrities signature. She says that she can but she has to ask her mother. They tell her to steal her mother’s phone. She says she can’t do that. The girls turn mean and it looks like they are about to throw water on her face. NM picks it up and drinks it all very fast. he chocks on it a little bit and MW pats his back and asks him if he was that thirsty? Cut to the brother’s room. MW is sitting in class. Two guys come in and talk about how that kid he beat up yesterday went to the hospital and HM is in really big trouble. HW looks through family albums and sees a photo of the previous wife who died 6 years ago. the Appa also talks about how his son is doing much better now. OH is working hard. One of her friends asks her if she is doing okay, she doesn’t’ look so good. She says she is fine, one of them studies a lot, I will make him a prosecutor or judge. The friend says this isn’t her real son, does she want to make him make her rich later? The oldest son isn’t that great, why did he hit my son? OH asks her what she really wants to say. She apologized to her, why are you still talking about it! The friends say it is because she pity’s her life. Your husband, do you know what he does around town? I saw him driving somewhere with a little girl that was half my size. I saw it. The other girls saw him talking to an insurance lady. OH is concerned, but she tries to play it off. the friend says that HJ is like a parasite that is sucking money from her to survive. It looks like this might have struck a nerve. The woman says OH is a widow with a handsome husband and is bragging about changing her fortune. Hahahaha. OH comes out and pulls that woman by the hair! Why are you saying those things to me! We are not friends at all! All the women start to fight. Later, OH says that woman is crazy, that is all nonsense, affair? F-you. She calls her husband but he isn’t’ accepting his phone call. OH yells, why is it so difficult to contact him! She gets up and starts washing the dishes angrily. Three girls mock NW as she walks. Daughter of a celebrity? Ha! NW turns around and looks at them. Cut to NM walking with SJ. SJ talks about the pretty eunnie that they saw with the dog, do you know her? I want to see her again. Cut to HM talking on the phone. He is angry and says he will kill him without anyone knowing about it. HM is looking through his parents home for money. It looks like he is looking through his brother’s things. Then he sees a hammer that is wrapped in paper. Meanwhile, the police go to MW’s house and talk to him about the kid that got beaten up. His parents are next to him as he talks to the police. When the police leave, HW tells MW that she will make ddukbogi for them. Appa tells his son that he was cool. Appa asks an agasshi that is standing at the bus stop, how can I get to the lake? He is smiling and is very polite. He says his navigation is broken will he see a sign. She says he can just drive that way. He asks her if she can just show him where to go, he can just drop her off. She says that’s okay. He smiles and says okay, thank you miss. He drives off, but then he stops and comes back. He gets out of his car and puts on white gloves. then he tells her that he told her to come with him. He bought an expensive car, you don’t’ like it? I told you to go with me, You should understand me when I tell you. She passes out and he drives off with her in his car. The bus comes right then. But then she starts to think about what her “friend” told her. She saw him driving with a woman. OH thinks that is the place he keeps his dog farm. She runs off. Cut to OH at a dog farm. it is super dark and creepy. OH wonders how he can have an affair at a place like that. She peeks in and sees his car. Then she bangs on the gate in anger. She sees him and hides. he has a woman’s bag and clothing. OH tries to hop the fence and she does. She plops on the other side and approaches the small building. When she peaks around the corner, she sees HJ burning all the clothing and looking in the bag at the ID. His face is all bloody. OH is scared S-less. She turns, but she makes some noise on a branch. he hears it and wonders who is there. Right then he gets a call from his son. He is at the police station. He tells him he is stupid and he will be there soon. Umma is hiding and safely escapes. then she thinks back to what her daughter told her. SJ – Aboji looks like a ghost….whenever I see him, he is so scary. Umma runs down the street as she calls out her daughters name. Cut to NM at home. He packs away some small money in a bag and then looks at the hammer in the trashcan. he picks it up and looks at his desk. VO – As abonim said, maybe Humans are just like animals. Brother is in the jail cell. NM shows up to get him out. VO – But to me, it is just common knowledge and law of living that I have to follow what abonim said. If I just go one step forward and look at it quietly, it is all wrong. I finally realized. NM walks to his classroom. NM is at her desk with her head on the desk. Girls comment on how she isn’t pretty even though the boys think she is. the sun is in NW’s face, so NM covers it. VO – It is not like humans become strong when I don’t’ have anything that makes me weak or pitiful. When I try to protect something, humans become strong. I finally realized that humans become humanly strong when you have something that you want to protect. NM is all grown up and is DJ now. He is shooting his gun at a police academy. VO – At that time, I decided, I will be strong. Cut to the classroom at the police academy. A professor is talking about a case where there is no evidence left over. There are a lot of cases that could have been left unsolved because he didn’t’ leave any evidence. he drove an expensive car or truck. He seduced or kidnapped different kinds of women and killed them. He hid all the bodies on the mountains or at his dog farm. Yoon Hee-jae married 4 times. He killed his 3rd wife by setting a fire. Later, he said he wants to help his kids living by writing a book on how he killed people. One of the reporters wrote, if psychopaths still have their fathership, it became in the news again. The important thing is, don’t’ forget about the victims family members pain. We study this case and should prevent this from happening again. DJ walks out and sits on a bench. he looks a little crazy. The lights turn out and DC stares at JY. She is in the ad for their drinks at the police school. he gets a drink and just looks at her. He is about to touch her face, but he doesn’t, he just mutters that she smiles. DJ – I thought you would always cry. VO – I will be strong and I will protect what appa said, the things that make me weak and pitiful, and my beautiful Nakwon (my beautiful Heaven or his Nak-won from his childhood). SJ – Are we running away? Umma – Just let us go! NM – Go far far away, as much as possible, where appa can’t find you. HJ – You knew it, you are more like me than Hyun-moo. NM – I am sorry for liking you. CJH – Do you remember Yoon Hee-jae, your real name is Gil Nak-won, right? Daughter of Ji Hae-won. DJ – (JY faints and DJ catches her) Nak-won ah….